This is a frame-lock knife with smooth and reliable deployment, innovative tactical coatings, and the quality of a Buck knife for an affordable price. The Bones® is a modern and high-tech design, with special attention to ergonomics, including a curved handle with grip points. These grip points are built-in at three critical pressure points to ensure a secure grasp. This is a frame-lock knife with smooth and reliable deployment, innovative tactical coatings, and the quality of a Buck knife for an affordable price. The Bones® is a modern and high-tech design, with special attention to ergonomics, including a curved handle with grip points. These grip points are built-in at three critical pressure points to ensure a secure grasp. To keep this knife at its lightest, the skeletal framework minimizes material weight, while maintaining strength. The blade is partially serrated for added performance. 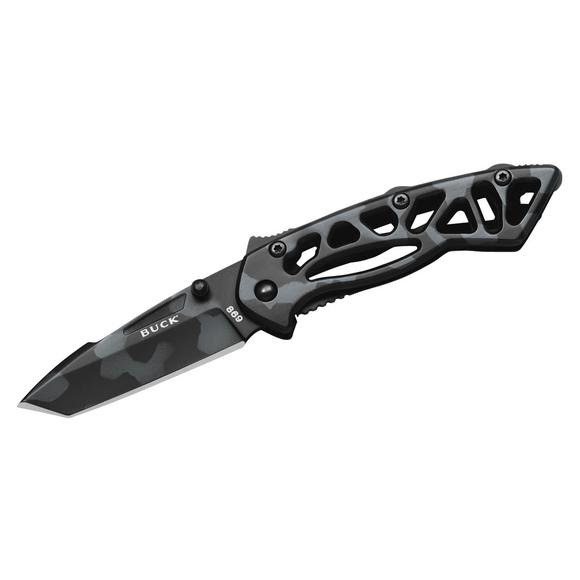 The knife features a one-hand ambidextrous open blade deployment with a thumb stud. Holding many of same features as the regular tanto blade, the angled point is modified between the front edge and the bottom edge on this particular blade. Holds up to piercing, scraping, and prying with tough materials.